Since its inclusion in the Electronic Communications and Transactions Act (ECT Act), some 16 years ago, the Advanced Electronic Signature has been treated a little like Cinderella, ignored by most and scoffed at by others. There are different reasons for this, but one of the major reasons is that the South African legal fraternity, like many of their peers globally, are notoriously slow at adopting technology and embracing change. As an example, legal management and litigation software had been around for a long time before it became mainstream in South African law firms. The same is happening to e-discovery software that has been around globally for a long time, but is only now, slowly, starting to be accepted due to some very vocal evangelists and a changing legal landscape. The same has happened to the Advanced Electronic Signature (Aes). It has always been around, but never really adopted. One of the reasons may be the way that we as legal professionals are trained. In my day and according to some of my more junior colleagues, even today, the ECT Act is glanced over as part of banking law, but never discussed in depth as part of any university course. The result is that we never really understand the application of electronic signatures in South African law and accordingly see it as a nuisance, rather than something to be embraced and adopted. Ironically, this is not a problem for the general public. Many people are happy to sign any document by copying and pasting a scanned image of their signature into a document. They are much quicker to adopt technology into their business processes than us legal professionals. I know that many of my colleagues will cry foul at this statement and point me to the inherent risks associated with pasting a signature into a document. Notwithstanding the obvious fact that some documents cannot legally be signed that way, they will also be quick to point out how easy it is to falsify a signature like that. 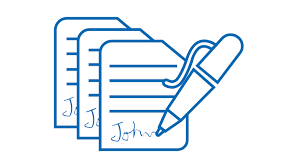 Arguments such as “anyone can copy and paste that signature into a document” are often raised, but have these colleagues considered that the same applies to a handwritten signature? How many contracts contain a clause these days along the lines of the document being capable of signature in counterparts and that a copy with one original and one faxed signature will be deemed an original? The main reason for such a clause is speed and efficiency, which I will come back to that later, but in all fairness, isn’t it just as easy to forge someone’s signature or to sign that document even if you are not the intended signatory and just fax it back, without anyone being the wiser? I would argue that that is even more risky than signing digitally and that our common law, which recognises a handwritten signature as the ultimate evidence of one’s intention to sign, is due for a shakeup and much sooner than we thought. In the rest of this series of articles, I am going to put forward my argument for why I believe that Aes is bound to shake up the way we sign documents soon and forever. Then I will go into the technicalities and legalities around electronic signing and how we are using it in our daily lives without even realising it. For this article, let’s consider the efficiency and expedience argument. Those counterpart clauses are there for a reason and the reason is that no one has the time anymore to sign in the presence of each other. South Africans are doing business globally on a larger scale than ever before and signing in the presence of each other is simply impractical, uneconomical and frankly wasteful. But even in South Africa, business is happening faster than ever and no one has the time to get together to sign the documents or to sign and courier it to the other party who has to repeat the process on their side. Again, that is just wasteful and slow. I have already pointed out that counterpart clauses have been introduced to circumvent this inefficiency, but I have also pointed out how insecure and unreliable that method is and let’s be honest, who uses faxes anymore? So, what if you could generate a document or contract, sign it digitally and then ,either through email or another electronic means, send it to the counterparty, who does exactly the same, all in the space of a few minutes or hours and all of this, anywhere in the world? Even better, what if both of the parties to this contract could, without any doubt, verify that the person signing the document on the other side of the world is in fact the intended signatory and that the document has not been changed or edited in the process? Can you do any of this with a faxed document? Have we even considered cyber security and the impact of privacy legislation such as POPIA and GDPR, which requires secure document handling and data integrity? Anyone who is not, in light of recent global and local events, awake to the reality of cybercrime and fraud, must have been hiding under a rock somewhere. Can we really afford to simply accept those contracts with scanned-in signatures anymore, without making sure it is not a fraudulent document? And this is the reason why Aes has been created. It creates a mechanism for South Africans to sign and execute documents at the speed of business and to ensure the integrity and veracity of both the document and every signatory to it. The counter argument to all of the above is typically that the use of Aes is complicated and it is much easier to sign by hand. Again, this is not true. It is as easy to sign by Aes as it is to sign by hand and with the added efficiencies that I have already pointed out, there is no argument to be made that Aes is too complex and cumbersome. In the next article, I will look at the law around Aes and discuss some use cases, but until then, take some time to consider the above and perhaps question whether the time has perhaps come to do things differently.